This fits perfectly into our Car Industry Strikes Back series. It is so car-centric that you'd place your money on the car industry if you had to guess who produced this Lose Your Licence and You're Screwed campaign. Thanks to our reader, Tony, for sending this along to us. 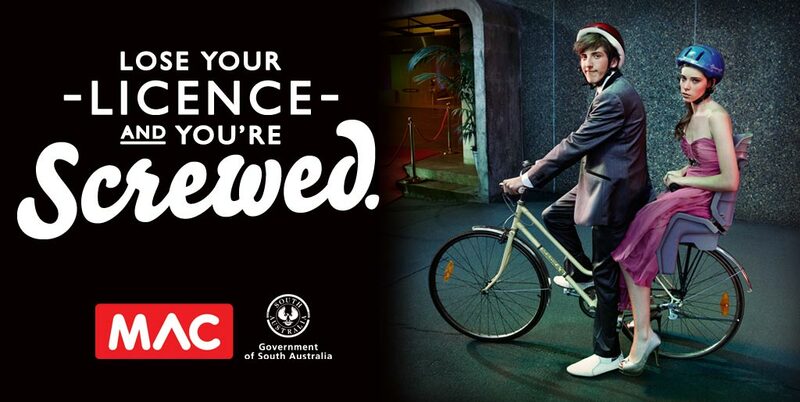 Amazingly, it is from a governmental organisation in South Australia - MAC, or The Motor Accident Commission. Oh, wait. Car insurance. We've seen THAT before, haven't we? What a brilliantly anti-bicycle campaign. A large sum of money was spent on hammering home the point to young people that bicycles are lame and that cars the only real, credible option for life in South Australia. And check out their poster, too. Marketing is needed badly if we are to promote urban cycling positively. Not marketing by avid cyclists. Not marketing by car-centric organisations. Real marketing aimed at Citizen Cyclists.